See also Background Resources for other books that summarize dragon myths and legends. Anderson, J. K. Tales of Great Dragons. Santa Barbara, CA: Bellerophon Books, 1994. Coloring book with legends and illustrations from many ancient sources. Quotes Topsells Historie of Four-Footed Beasts. Baxter, Nicola. My Book of Dragon Stories. Illus. Andrew Warrington. Bath: Parragon, 2000. 288 pp. Carus, Marianne, ed. Fire and Wings: Dragon Tales from East and West. Illus. Nilesh Mistry. Chicago: Cricket Books, 2002. The Introduction by Jane Yolen discusses the appeal of dragon stories. The fifteen tales include retellings of folktales from the Ukraine, Poland (see Domanska, King Krakus and the Dragon, in folktale picture books), China, Korea (a tale similar to Yep's The Dragon Prince; see folktale picture books), and Japan; several satiric tales, including Yolen's "The King's Dragon," and other new tales. Many of them were published in Cricket Magazine. E. Nesbit's "The Last of the Dragons" (1925) is also reprinted, about a tame dragon that becomes the first airplane. Realistic black and white illustrations with every tale. Click here for review of "Thoughts of a Drought Dragon" by a student. Clark, Margaret, ed. A Treasury of Dragon Stories. Illus. Mark Robertson. New York: Kingfisher, 1997. Fifteen dragon stories, classic and modern, in a compact book with black and white drawings. In The Secret in the Matchbox by Val Willis (which was also published as a picture book), the children warn their teacher that Bobby has a dragon in school, but she refuses to pay attention until the tiny dragon grows as big as an elephant. The joke is on the teacher and Bobby has the upper hand; when he makes the huge, hot, destructive dragon shrink back to fit in his matchbox, Bobby smiled a secret smile (p. 81). Dann, Jack, and Dozois, Gardner, ed. The Dragon Book. Ace Books, 2009. New magical tales from modern fantasy writers. Not sold as a children's book. Doherty, GIllian. Usborne Stories of Dragons. Illus. Linda Edwards. London: Usborne, 2006. Unfortunately, this book contains no acknowledgements or notes on the sources of the twelve stories. For example, "Jack and the Dragaman" appears to be a retelling in standard English of the Appalachian Jack tale. It says that Will, Tom and Jack live in a log cabin miles from anywhere. They rescue one girl from the dragaman and the girl doesn't help much in the escape. Jack cuts the dragon's head off after trying twice with a hatchet and getting hurt with a fireball. See more authentic versions of the Appalachian tale on AppLit page "Jack and the Fire Dragon." A Dragon Lover's Treasury of the Fantastic. New York: Severn House, 1995. Stories by famous authors. Fuller, Muriel O., ed. The Book of Dragons: Tales and Legends from Many Lands. Illus, Alexander Key. 1931. New York: Dover, 2001.181 pp. Key's 4 color illustrations are omitted from the Dover reprint. His small b/w illustrations are retained. Twenty tales written for children, beginning with Siegfried from Germany and ending with E. Nesbit's "The Last of the Dragons." Green, Roger Lancelyn. The Hamish Hamilton Book of Dragons. 1970. Hague, Michael. The Book of Dragons. New York: Morrow Junior Books, 1995. Legendary stories by Lewis, Tolkien, Nesbit, Grahame, Calvino, etc. In Hague's spectacular, colorful illustrations, some of the dragons are too goofy-looking. No source notes are given. Click here for review by a student. Keding, Dan, and Amy Douglas, eds. English Folktales. World Folklore series. Westport, CT: Libraries Unlimited, 2005. 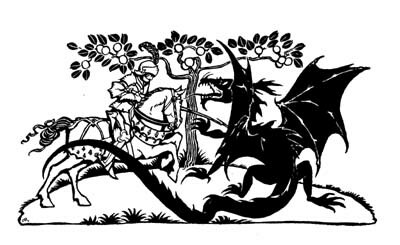 A section on Dragons and Devils includes "The Lambton Worm," "The Laidly Worm," "Pollard and the Brawn; Recipe for Stotty Cake," "The Devil and the Coracle," "The Devil in Wem," and "The Devil and the Stiperstones." Lister, Robin. The Legend of King Arthur. Illus. Alan Baker. Doubleday, 1990. Fourteen stories told from Merlins point of view. Manning-Sanders, Ruth. A Book of Dragons. Illus. Robin Jacques. New York: Dutton, 1964.
International collection by a British author, labeled fairy tales about dragons (not legends like St. George). McCaffrey, Anne. A Gift of Dragons. Illus. Tom Kidd. New York: Ballantine, 2002. Four dragon tales about Pern are illustrated with Kidd's sepia borders and drawings. "The Smallest Dragonboy," McCaffrey's popular early story, was published in Science Fiction Tales in 1973. "The Girl Who Heard Dragons" (a Tor book in1994) and "Runner of Pern" (from Legends: Short Novels by the Masters of Fantasy,1998) are both about girls' dragon adventures. "Ever the Twain" is a new tale in this volume. Moseley, Keith, and M. P. Robertson. Dragons: A Pop-Up Book of Fantastic Adventures. Mascot, N.S.W. : Koala Books, 2006. "Dragons are popular as never before--and here they pop up in fire-breathing action! Five dramatic dragon stories from around the world, including Beowulf and the Firedrake, St. George and the Dragon," The Four Dragons, Maud and the Wyvern, and The Sea Dragon Princess. Nesbit, E. The Complete Book of Dragons. 1900. Rpt. Illus Erik Blegvad. New York: Macmillan, 1972. Tales with modern details, humor, and feminist twists, including The Last of the Dragons. See also Satiric Picture Books. Perham, Molly. King Arthur and the Legends of Camelot. Illus. Julek Heller. New York: Viking, 1993. Prelutsky, Jack. The Dragons are Singing Tonight. Illus. Peter Sis. New York: Greenwillow, 1993. Poems and pictures, mostly comic, with varied perspectives by and about dragons and kids. Some dragons are tame, some are imaginary, some are troublesome, some are threatening, and some are awesome. Preiss, Brian, et al. The Ultimate Dragon. Dell, 1995. 313 pp. The Ultimate series prints state-of-the art stories on each theme (no reprints). This volume includes tales by Tanith Lee, Ursula K. Le Guin, and Jane Yolen. Rawson, Christopher. Stories of Dragons. Illus. Stephen Cartwright. Usborne Young Reading, Series 1. London: Usborne, 2003. Also produced as audiobook 2005. Four stories: "All about Dragons," "Stan and the Dragon," "Wicked Worm," "Victor Saves the Village." Spicer, Dorothy G. 13 Dragons. Illus. Sofia. New York: Coward, McCann, 1974. International tales. In a Swiss tale, "The Dragon, Sliced in Two" (pp. 88-100), an orphan, on a quest to gain riches, uses his wits to overcome obstacles. Stallman, Birdie. Learning About Dragons. Illus. Lydia Halverson. Chicago: Childrens Press, 1981. Tchana, Katrin. The Serpent Slayer and Other Stories of Strong Women. Illus. Trina Schart Hyman. Boston: Little, Brown, 2000. Several of the tales are about female heroes facing serpents and dragons. Brief source notes and beautiful illustrations are provided. "The Magic Lake" from Latin America contains a blood-red flying serpent that breathes fire. Willis, Jennifer Schwamm. The Book of Wizards: Stories of Enchantment from Near and Far. New York: Thunder's Mouth Press, 2004. Wynn, Thaddeus, and Juliette Wynn. The Tale of a Dragon. Illus. Denise Hughes, and Angela Williford. Raleigh, NC: Pentland Press, 1999. 85 pp. "Book contains a series of  stories about Draggy the Dragon, his family, and his friends" (Worldcat). From the authors: "Draggy is a little Dragon, who lives in the Forest of the Fireflies. He is raised by his beloved Granmama and has many marvelous adventures with his forest friends. There is a subtle moral message that is being sent to the young minds.... Draggy is taught and raised to be respectful, loyal, moral, and to treat others as he would want to be treated. There is entirely too much fierceness in this world today, and we are trying to teach young children the proper and decent morals which are lacking in so many areas of our country." 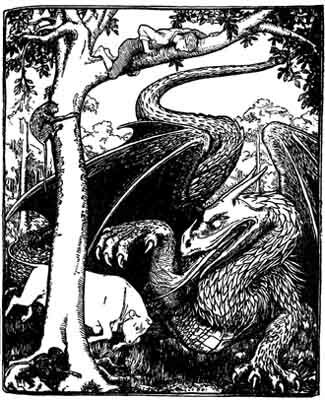 Eight stories and five poems about dragons, some humorous but most serious, include selections from Yolens longer works, such as The Dragons Boy, later made into a novel about King Arthur as a boy, and Cockfight, which developed into the Pit Dragon Trilogy of novels about young trainers of dragons that fight for sport on another planet. Includes short introductions with some personal anecdotes about the origins of each piece. Click here for review of "Great-Grandfather Dragon's Tale" by a student. See cover and details in Jane Yolen's web site. See also Heidi Anne Heiner's excellent web site SurLaLuneFairyTales.com. Use the search function at her site to find other tales about dragons. Adams, Richard. "Stan Bolovan and the Dragon." The Unbroken Web: Stories and Fables. New York: Crown, 1980. pp. 76-85. Color plates by Yvonne Gilbert. Black and white drawings by Jennifer Campbell. Each tale in this collection of animal stories is a kind of dramatic monologue in prose, with a narrator in a realistic setting. A schoolmaster tells this Romanian tale to restless boys on the last full day of their school term; he instructs them to write a composition on the moral of the "edifying" story, but does not leave time to make them do so in the end. A clever peasant boy outwits a dragon while working for him and eventually chases him off, keeping his sacks of gold. Adams shows that his narrator is more hip than he seems, including some popular culture references to Boris Karloff, Chinese restaurants, sports, and lines such as "Make a new plan, Stan." The Bible. Fairrosa provides a list of links to Bible verses about dragons. Dragons in the Bible. Fairrosa Cyber Library, 1996. Broun, Heywood. The Fifty-first Dragon. In Famous Monster Tales. Ed. Basil Davenport. Princeton, NJ: Van Nostrand 1967. Calvino, Italo. The Dragon and the Enchanted Filly. Italian Folktales. Trans. George Martin. 1956. Rpt. New York: Harcourt, 1980. pp. 273-77. Also reprinted in Michael Hague, The Book of Dragons, 1995. A story that Calvino had heard told by an old woman of the people in Pisa (p. 731). Her magic filly instructs the queen to escape her prospective husband as he is transformed into a dragon, by fleeing and making her own way in the world disguised as a man. The filly ultimately conquers the dragon, a feat which leads to her own transformation and the revelation that she is a beautiful lady who had been under a spell. Although the queen finds a more suitable husband in the middle of the tale, a prince who is the only one to see through her masculine disguise, she is not rescued by men in any part of the tale. A combination of magic, physical strength, and trickery enables the two united female characters to triumph over the dragon. Calvino, Italo. The Dragon with Seven Heads. Italian Folktales. Trans. George Martin. 1956. Rpt. New York: Harcourt, 1980. pp.189-96. Among the adventures of an enchanted fisherman's family, the eldest of triplet sons rescues a princess when it is her turn to be eaten by a dragon at noon. The dragon is similar to the hydra killed by Hercules, because it regrows heads the youth cuts off, until he cuts off all seven and removes the tongues. An imposter steals the heads and tries to claim the hand of the princess, but the youth uses the tongues to prove who is lying. The youth marries the princess and the imposter is hung. Caswell, Helen. The Dragon. Shadows from the Singing House: Eskimo Folk Tales. Illus. Robert Mayokok. Tokyo: Chas. Tuttle, 1968. pp. 88-93. Chase, Richard. Old Fire Dragaman. The Jack Tales: Folk Tales from the Southern Appalachians. Illus. Berkeley Williams, Jr. Boston: Houghton, 1943. pp. 106-13. Related to various Appalachian tales with similar motifs, this tale combines giant and dragon images when trickster Jack rescues pretty girls from the Dragamans underground lair. Some see links with Beowulf. See also Gail E. Haleys picture book Jack and the Fire Dragon. Boston: Little, Brown, 1988. Chase's tale reprinted in Judith Saltman, ed. The Riverside Anthology of Children's Literature, 6th ed. Boston: Houghton, 1985, and Virginia Haviland, ed. North American Legends. New York: Collins, 1979. More details on this tale and many variants in AppLit. Coville, Bruce, ed. Half-Human. Illus. Marc Tauss. New York: Scholastic, 2001. 224 pp. A collection of transformation tales with contemporary settings that include mermaids, selkies, centaurs, dragons. By well-known authors such as Jane Yolen, Tamora Pierce, and Nancy Springer. Doherty, Gillian. Usborne Stories of Dragons. London: Usborne, 2006. Twelve stories. Unfortunately, this book contains no acknowledgements or notes on the sources of stories. For example, "Jack and the Dragaman" appears to be a retelling in standard English of the Appalachian Jack tale. "The Dragon's Blood" and "The Sword Gram and the Dragon Fafnir." From The Children of Odin by Padraic Colum. Illus. Willy Pogany. New York: The Macmillan Company, 1920. Reprinted in The Baldwin Online Children's Literature Project, 2000-2008. "Fafnir, the Dragon." From The Story of Siegfried by James Baldwin. (New York: Charles Scribner's Sons, 1905). Reprinted in The Baldwin Online Children's Literature Project. Flint, Eric, and Michael D. Resnick, ed. The Dragon Done It. Riverdale, NY: Baen Books, 2008. Collection of fantasy detective stories. Not a children's book. Gäg, Wanda. The Dragon and his Grandmother. Tales from Grimm: Freely Translated and Illustrated by Wanda Gäg. New York: Coward, McCann, 1936. A similar tale from Austria is retold in Dragon Feathers (1993), with fascinating fantasy illustrations by Russian artists Andrej Dugin and Olga Dugina. Various motifs in these stories indicate that the dragon represents the devil; The Dragon and His Grandmother contains the explicit statement, "The dragon, however, was none other than the devil," while there are obvious connections with another story collected by the Grimms, The Devils Three Gold Hairs. The cooperation between the young hero of the story and the woman who links the predatory dragon with humanity provides a fascinating example of men and women cooperating to overcome evil obstacles. See Lang's version below. Gardner, John. Dragon, Dragon and Other Tales. Illus. Charles Shields. New York: Knopf, 1975. A dragon-slaying adventure with modern and comic twists is the title story. Grimm Brothers. Two Brothers. A complex folk tale with dragon-slaying, found in many editions. See Links to Online Texts for sites where different editions of Grimms' tales are available. Hamilton, Virginia. In the Beginning: Creation Stories from Around the World. Illus. Barry Moser. New York: Harcourt Brace, 1998. "Marduk, God of Gods: Apsu and Tiamat the Creators," pp. 78-85. Hamilton retells the Babylonian myth in which Tiamat, the sea waters, who was said to be a dragon, "gave birth to monster serpents," including "roaring drgaons, bloodless and filled with posion. And she crowned them with haloes, so they would look like gods. Looking upon them, the onlooker would perish." After Marduk defeats Tiamat and her monsters, he makes half of her into the heavens and half into the Earth. Hawthorne, Nathaniel. "The Dragon's Teeth." Tanglewood Tales. Available in many editions, including this reprint at The Baldwin Online Children's Literature Project with illustrations. Retelling of the ancient Cadmus creation story, set in Phœnicia. 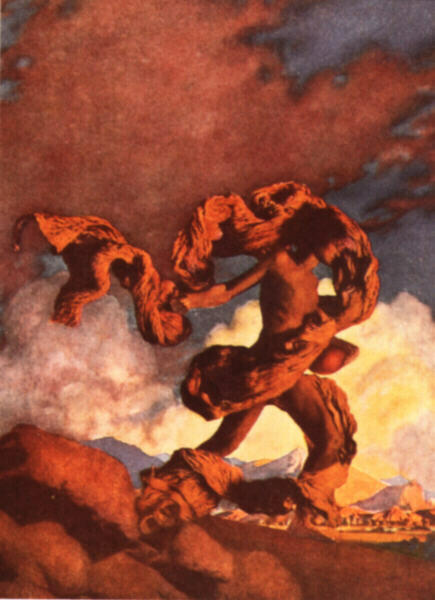 Illustration at left of Cadmus sowing dragon teeth is by Maxfield Parrish, 1908. "Ilya Muromets and the Dragon." Russian Folk Tales. From the collections of Alexander Afanasyev. Transl. Norbert Guterman. Illus. Alexander Alexeieff. 1945. Rpt. New York: Pantheon, 1973. pp. 569-74. Jacobs, Joseph, ed. The Laidly Worm of Spindleston Heugh. Childe Wynd rescues his sister after her wicked stepmother turns her into a bloodthirsty dragon. Related to other old ballads and tales of Kemp Owain or Childe Wynde of Northumberland, and Dove Isabeau by Jane Yolen and Dennis Nolan (see picture books page). Reprinted online from English Folk and Fairy Tales at Rick Walton, Children's Author: Classic Tales and Fables, and at SurLaLune Fairy Tale Pages. Jacobs, Joseph, ed. "The Lambton Worm." More English Fairy Tales. New York: G. P Putnam's Sons, 1894. Reprinted with Jacobs' notes at SurLaLune Fairy Tales Pages (this link) and Gutenberg.org. Jacobs, Joseph, ed. "The Little Bull-Calf." More English Fairy Tales. Reprinted at various sites online, including this link to Project Gutenberg. Illustration at right by John Batten. A bull that his father gives to a boy helps protect the boy from a mean stepfather and various wild animals, and attacks a dragon that kills the bull. But the boy follows advice from the bull, using the bull's bladder to defeat the dragon and save a princess. The source is Gypsy Lore Journal, iii. Jacobs' notes mention a similarity with "Jack and the Giants." Lang, Andrew. "The Dragon and his Grandmother." The Yellow Fairy Book. Reprinted online at Rick Walton, Children's Author: Classic Tales and Fables. See Gäg's version above. Lang, Andrew. "The Dragon of the North." The Yellow Fairy Book. Reprinted online at Rick Walton, Children's Author: Classic Tales and Fables. Lang, Andrew. "How the Dragon was Tricked." The Pink Fairy Book. Reprinted online at Rick Walton, Children's Author: Classic Tales and Fables. Lang, Andrew. "The Prince and the Dragon." The Crimson Fairy Book. Reprinted online at Rick Walton, Children's Author: Classic Tales and Fables. "Lazarus and the Dragons." Clever Tricksters. Glendale, CA Bowmar, 1974. The Best in Children's Literature, Series 3. Primary school kit of 3 books, cassette and guide, with 4 tales of "the crafty trickster who outwits a powerful but stupid enemy," including also "Molly Whuppie" (WorldCat). Low, Alice. "The Quilted Elephant and the Green Plush Dragon." 1991. Rpt. Stories to Tell a 5-Year-Old. Ed. Alice Low. Illus. Heather Harms Maione. Boston: Little, Brown, 1996. pp. 74-80. The green dragon becomes the rival of the old quilted elephant but Roger loves and sleeps with both and refuses to trade either one in a deal he makes with another, less gentle boy, Kevin. Several line drawings accompany each story in this collection of old and modern tales. MacDonald, Margaret Read. Celebrate the World: Twenty Tellable Folktales for Multicultural Festivals. Bronx, N.Y.: H.W. Wilson, 1994. Titles with dragons include "Little Rooster and the Heavenly Dragon" and "The Small Yellow Dragon." Monster Stories. Illus. Jane Launchbury. New York: Derrydale, 1987. In David and the Dragon a boy takes in for the winter a frightened, cold young dragon who was left behind when his family migrated. In Cecil the Lazy Dragon, by Sally Sheringham, young Cecil burns down the house by sighing in bed, then appeases his parents by selling fast food which he cooks with his breath from his new big bed. Monte, Richard. The Dragon of Krakow and Other Polish Stories. Illus. Paul Hess. London: Frances Lincoln Children's, 2008. 83 pp. Musick, Ruth Ann, ed. Green Hills of Magic: West Virginia Folktales from Europe. 1970. Rpt. Parsons, WV: McClain Printing, 1989. Section 5, "Dragons, Giants, and Other Monsters," contains several tales with dragons. Nesbit. E. "The Last of the Dragons" (1925). Crosscurrents of Children's Literature: An Anthology of Texts and Criticism. Ed. J. D. Stahl, Tina L. Hanlon, and Elizabeth Lennox Keyser. New York: Oxford Univ. Press, 2006. In Part 7, Satires and Spin-Offs: Reworking Classic Children's Literature. This anthology also reprints Jane Yolen's "Dove Isabeau," the ballad "Kemp Owyne," selected poems from Jack Prelutsky's The Dragons are Singing Tonight, and essays by Jon Stott and Ursula K. LeGuin about dragons and fantasy literature. Ragan, Kathleen, ed. Fearless Girls, Wise Women & Beloved Sisters: Heroines in Folktales from Around the World. New York: Norton, 1998. Heroines who defeat dragons appear in "Hiiaka and the Seacoast Kupuas" (Hawaii) and "Nanobalele, Who Shines in the Night" (Basotho People, Lesotho in Sub-Saharan Africa). "Saint George." From In God's Garden: Stories of the Saints for Little Children by Amy Steedman. Philadelphia: George W. Jacobs & Co. n. d. Reprinted in The Baldwin Online Children's Literature Project, 2000-2008. "St. George and the Dragon." "Adapted from the English legend." From anthology For the Children's Hour by Carolyn Sherwin Bailey. Reprinted in The Baldwin Online Children's Literature Project, 2000-2008. "St. George and the Dragon." From The Book of Legends Told Over Again, by Horace E. Scudder. Boston: Houghton Mifflin, 1899, 1900. No. 144 in The Riverside Literature Series. Reprinted in The Baldwin Online Children's Literature Project, 2000-2008. "St. George and the Dragon." Retold by J. Bert Esenwein and Marietta Stockard. The Children's Book of Virtues. Ed. William J. Bennett. Illus. Michael Hague. New York: Simon & Schuster, 1995. pp. 53-62. This tale is in the section labeled Responsibility, Work, Self-Discipline. In this version of the tale, St. George does not Christianize a kingdom after killing the dragon. He leaves his own castle, where everyone is "safe and happy," to find a place where people would need his courage and protection. In the end he marries the princess and rules after her father dies, making their people forever "happy and safe." Although most of Hague's illustrations are attractive, as in his other books with dragons, the dragon is quite goofy looking even though this story is not humorous like "The Reluctant Dragon." "St. George of Merrie England." From English Fairy Tales, retold by Flora Annie Steel. 1918. The Macmillan Company, 1962. Reprinted in The Baldwin Online Children's Literature Project, 2000-2008. Saltman, Judith, ed. The Riverside Anthology of Childrens Literature. 6th ed. Boston: Houghton, 1985. Contains "St. George and the Dragon" by Kenneth McLeish, "Fafnir, the Dragon" by James Baldwin (Germany), "Heracles" with the Hydra episode by Leon Garfield and Edward Blishen, "Old Fire Dragaman by Richard Chase (Appalachian—see Chase above). Shepard, Aaron. "Nonny and the Dragon." Author Online! Aaron Shepard's Home Page. This is a light-hearted original tale about a boy who volunteers to be a dragon-fighting knight for the king. He finds out that the dragon he is sent to combat does not destroy knights, just burns their armor off until they are naked and embarrassed. The dragon gives him a book explaining non-violent ways of dealing with dragons. Full text online at http://www.aaronshep.com/stories/002.html. Snell, Sophie. The Dragon's Christmas. Audiobook. Sophie Snell, 2006. 45 min. The title story is described as "featuring wizards and magic at Christmas, the laugh out loud story of the Bethlehem dragon." The web site contains an audio clip called "Dragon's Flight." "Sowing Dragon's Teeth." From Stories of the Ancient Greeks by Charles D. Shaw. Illus. George A. Harker. Boston: Ginn & Company, 1903. Reprinted in The Baldwin Online Children's Literature Project, 2000-2008. Stearns, Michael, ed. A Wizard's Dozen: Stories of the Fantastic. New York: Scholastic, 1993. "The Breath of Princes" by Alan P. Smale is about a princess being rescued from a dragon. Steel, Flora Annie. English Fairy Tales. Illus. Arthur Rackham. Macmillan, 1918. Contains "St. George of Merrie England," with drawing at left, and "The Laidly Worm," about Margret and her brother Childe Wynde, set in Bamborough Castle, with one line drawing. Book reproduced in Project Gutenberg with illustrations. Tolkien, J. R. R. The Book of Lost Tales: Part II. Ed. Christopher Tolkien. London: Allen & Unwine, 1984. "This second part of The Book Of Lost Tales includes the tale of Beneren and Luthien, Turin and the Dragon, Necklace of the Dwarves, and the Fall of Gondolin. Each tale is followed by a commentary in the form of a short essay, together with the texts of associated poems, as well as information on names and vocabulary in the earliest Elvish languages." Trease, Geoffrey. The Dragon Who Was Different: And Other Plays for Children. London: Muller, 1938. "The Wings of the Dragon: How Padraig Made Irish Wit a Journeyman to Florentine Genius." From In the Days of the Guild by Louise Lamprey (New York: Fredrick A. Stokes, 1918). Reprinted in The Baldwin Online Children's Literature Project, 2000-2008. "Yellow Thunder Dragon" (China). Told by Jenni Cargill. Wonder Tales of Earth and Sea. N.S.W.? : J. Cargill, 1999. Award-winning Australian CD. Music by Ian Blake. Yolen, Jane. "Dove Isabeau." Reprinted in Crosscurrents of Children's Literature: An Anthology of Texts and Criticism. See Nesbit, above, and, for more on this tale, page on Dragons in Picture Books: Folktales. Yolen, Jane. Great-Grandfather Dragons Tale. Dragons and Dreams: A Collection of New Fantasy and Science Fiction Stories. Ed. Jane Yolen, et al. New York: Harper, 1986. No illus. See cover and details in Jane Yolen's web site. Yolen, Jane. "Mighty Mikko." Mightier than the Sword: World Folktales for Strong Boys. Illus. Raul Colón. New York: Silent Whistle/Harcourt, 2003, pp. 87-97. With one black and white full-page drawing of the dragon and fox. This tale based on Parker Fillmore's Finlandic version is similar to "Puss and Boots," "with a fox instead of a cat and a dragon instead of an ogre" as well as revisions by Yolen. Mikko, the young hero, is lonely after his parents die, but his father instructed him to look in snares in the wood, where he finds a red fox. It encourages him to try marrying the princess and the fox and tricks the king into believing that Mighty Mikko is a famous warrior. Later the fox tricks people around the dragon's castle to say they are Mikko's men. The fat, lazy dragon has stolen the castle and lies on his stolen treasures. "Dragons are big. And many are dangerous. No one ever said that dragons are smart. The fox counted on that" (p. 96). The fox frightens him into hiding in the fireworks shed because the king is coming to defeat him, and the fox burns the shed. After Mikko is happily settled in the castle, the fox returns to the woods, thankful that Mikko had saved his life. Zipes, Jack, ed. The Outspoken Princess and the Gentle Knight: A Treasury of Modern Fairy Tales. Illus. Stephanie Paulin. NY: Bantam, 1994.